Houseplants make a great addition to any décor. Plus, they help purify the air. But remember, no plant likes to be left in the corner like a piece of furniture and forgotten. 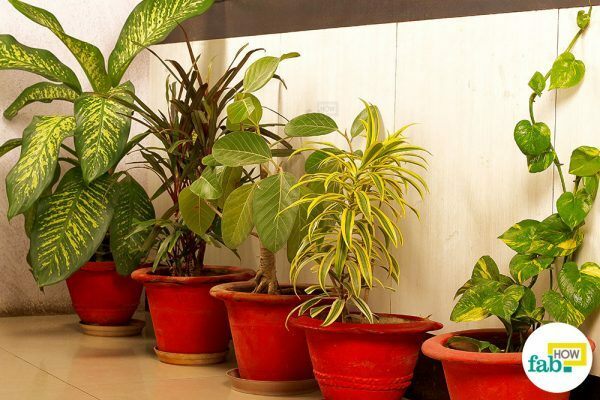 Many people don’t realize that indoor plants need more care and attention than outdoor plants. This is because outdoor plants are exposed to wind and rain, which together help keep them clean and healthy. When not cleaned on a regular basis, leaves of indoor plants accumulate a layer of dust, dirt and other airborne particles that make them unattractive and dull-looking. Regular cleaning will keep them looking great and also have a positive impact on their health and growth. The leaves of most plants actually help regulate air and water coming in and out of the plant. Keeping the leaves free of buildup allows the plants to carry out these processes effectively. Cleaning also helps control insects and other pests, too. 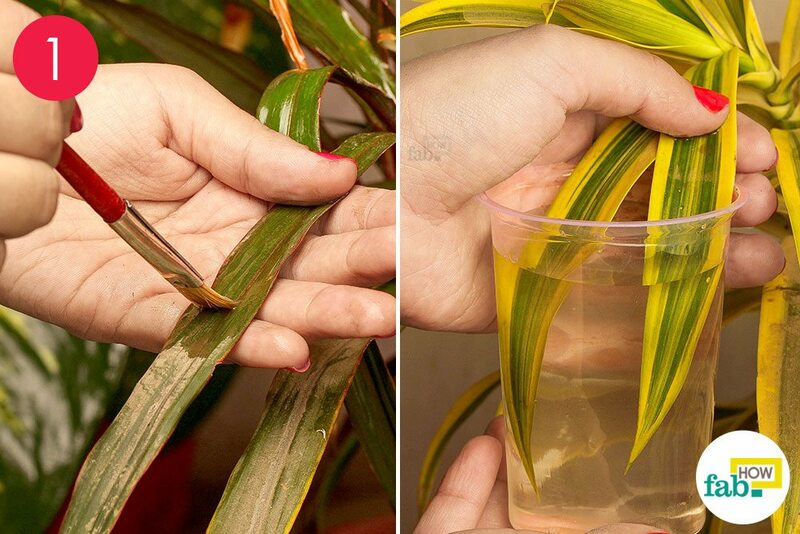 Cleaning houseplants is not a difficult task and doesn’t cost anything. It is such a simple task that anyone can do it with ease. 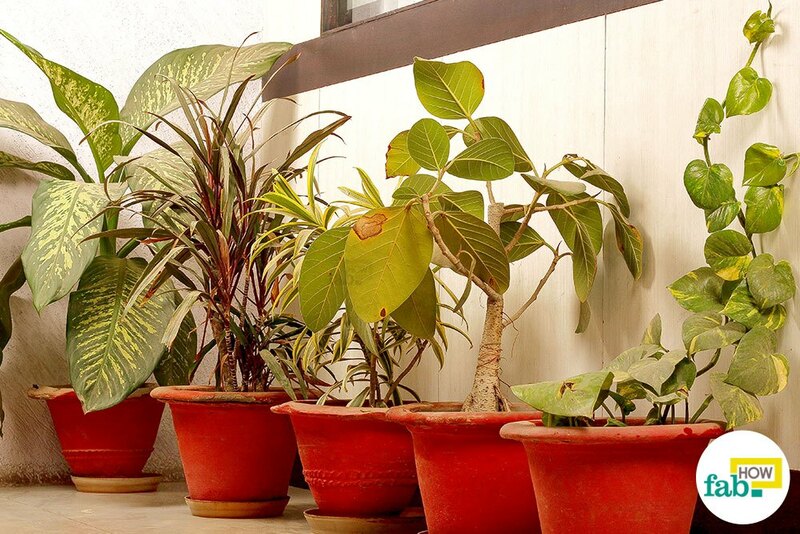 Begin by simply dusting the leaves of your plants to remove as much accumulated dust and dirt as possible. Gently brush the leaves, starting from the base and working toward the tip to dislodge dust and other debris. This step is important before moving onto using water to make the cleaning process easier. 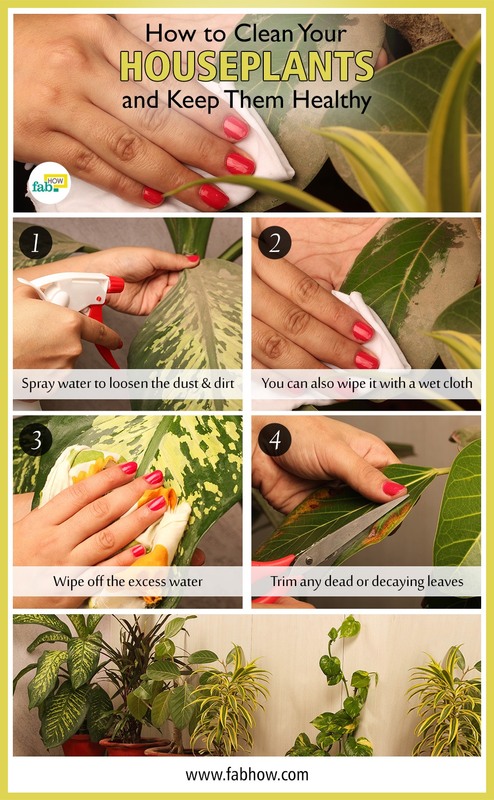 For houseplants with thin leaves, cleaning each and every leaf with the method described above can be tiring as well as time-consuming. Alternatively, you can immerse the leaves in a disposable glass filled with water. However, do not immerse the leaves for a long time. Next, spray water on the dirty leaves. Water will help further loosen the dust and dirt. 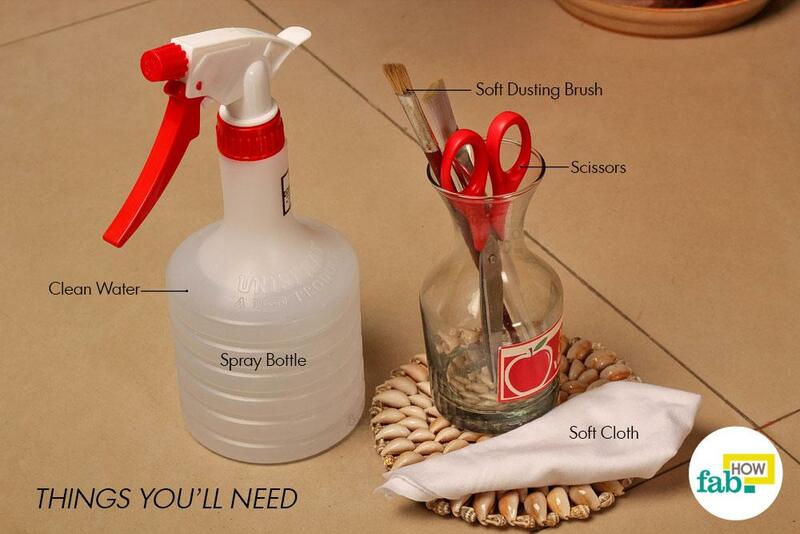 Spray from a distance and keep the pressure to the minimum to get water where it is needed without overdoing things. Also, do not over-soak the leaves or go over the leaves too many times. Another way to clean the broad leaves is to dip a lint-free cloth in a bowl of water, wring out the excess water and use the wet cloth to wipe the leaves gently. Work from the base to the tip of each leaf. Support the leaves from below with your hand to prevent tearing. Using a soft cloth or lint-free cloth, gently wipe each and every leaf of the plants to remove the extra water as well as the dust. This step is particularly effective for cleaning houseplants that have broad leaves. 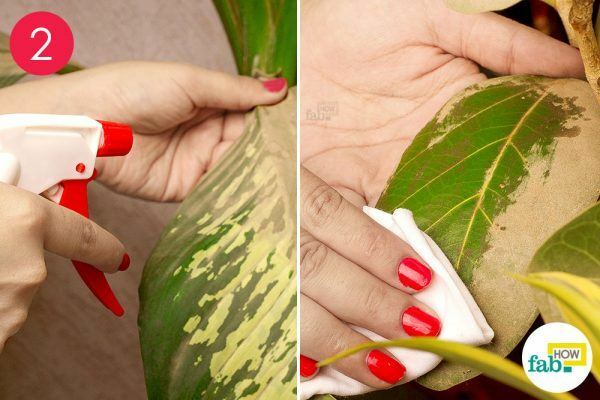 While cleaning the leaves, support them with your other hand and do not press down hard while rubbing them. Be as gentle as possible when wiping the leaves. When you are done cleaning the leaves, you need to trim away any dead or decaying leaves. Use a clean pair of scissors to trim just the damaged parts. This is important because damaged or brown leaves will gradually cause more damage to the plants. Removing them allows the plant to direct energy and resources to the healthy leaves. 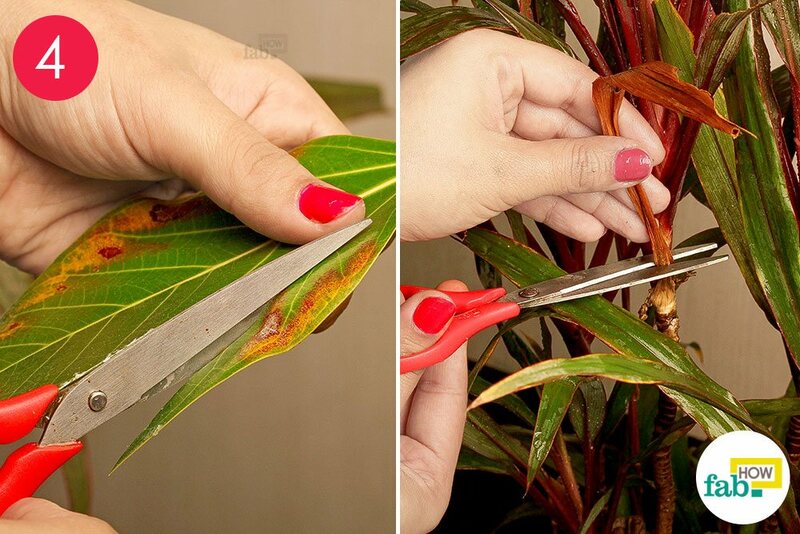 Return the houseplants to their original place once dry, and clean them once every couple of months. If you live in a dusty area, clean them more often. For smaller potted plants, wrap the soil with aluminum foil and flip the potted plant in a bucket of warm water. Then, shake off the extra water and remove the foil. On a sunny day, you can put your plants outside and spray water over the leaves using a watering can. Leave them outside in the sun for an hour before bringing them back indoors. 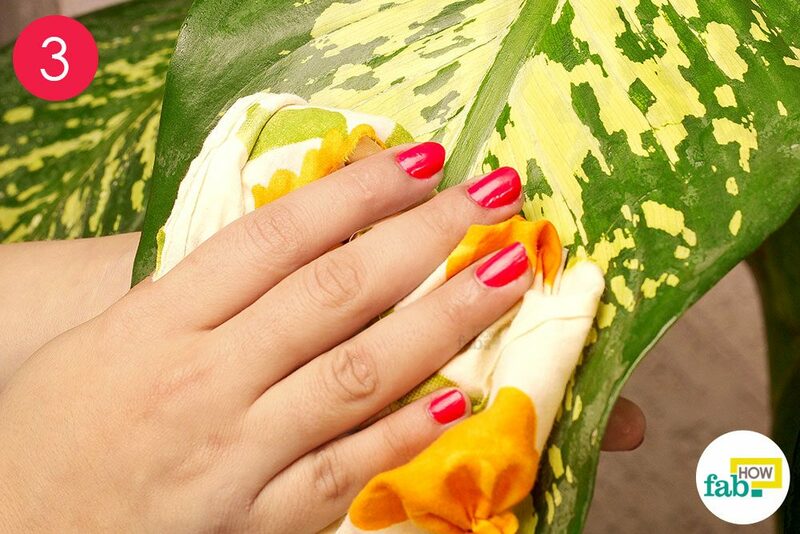 Do not use milk, beer, mayonnaise, mineral oil or banana skins to add shine to the leaves. 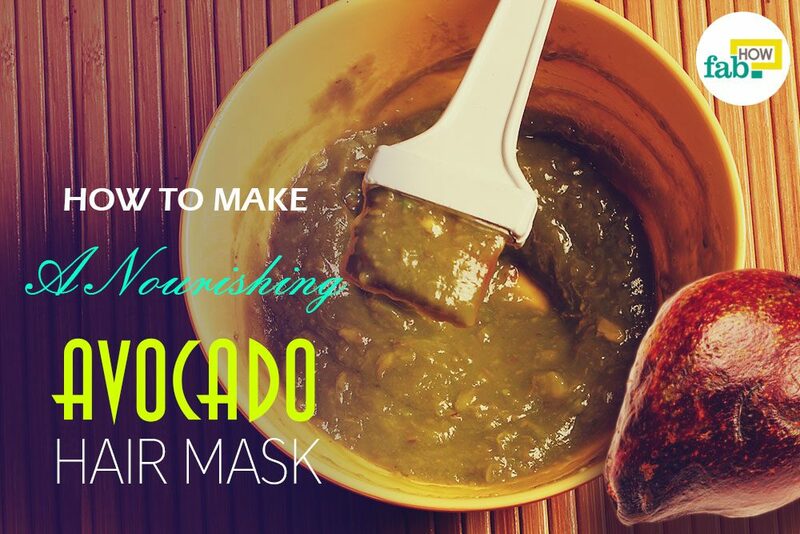 They can block the pores, causing more damage to the leaves in the long run. Plus, these sticky agents cause more dust and dirt to settle on the leaves. Avoid using commercial leaf shine-boosting products that can clog the plant’s pores, in turn affecting the photosynthesis and respiration process. Mist your houseplants at least once a week to prevent dust from settling and sticking to the leaves. It will also prevent the leaves from drying out. Never use cold or hot water to clean houseplants, as the extreme temperatures can damage the foliage. Use room temperature water only. Trim all dead or yellowing leaves regularly. Pick up all fallen leaves and dead leaves from the soil. If not removed, they provide a breeding place for pests and disease. While cleaning, if you notice signs of small bugs or damage from the disease on the leaves, use neem oil or other organic products to treat them as quickly as possible.